The Marky Award was inspired by Mark Hillsamer, the Librarian at St. Alban’s School, Washington, DC for 36 years. Mark helped to establish AISL in 1987 and fostered its growth for 14 years. It very well may have been “Mark’s smiling face, soothing voice, and wry sense of humor” that kept the organization going during those years. Walter DeMelle formally announced Mark’s retirement at the Skip Anthony Lecture Banquet in 2001 and presented Mark with a special gift: a mask from Thailand of a lovely lady who holds her index finger gently to her lips in a familiar shushing gesture. The Marky Award has been given annually since 2002, honoring AISL members who had made a significant contribution to the organization over a long period of time. A mounted replica of Mark’s gift is given to the winner to be displayed in his or her library until the next conference, together with a small unpainted replica of the mask for the honoree to keep. The honoree is chosen by the past Marky winners and is presented with the award at the annual Skip Anthony banquet. You can see a list of past winners here. 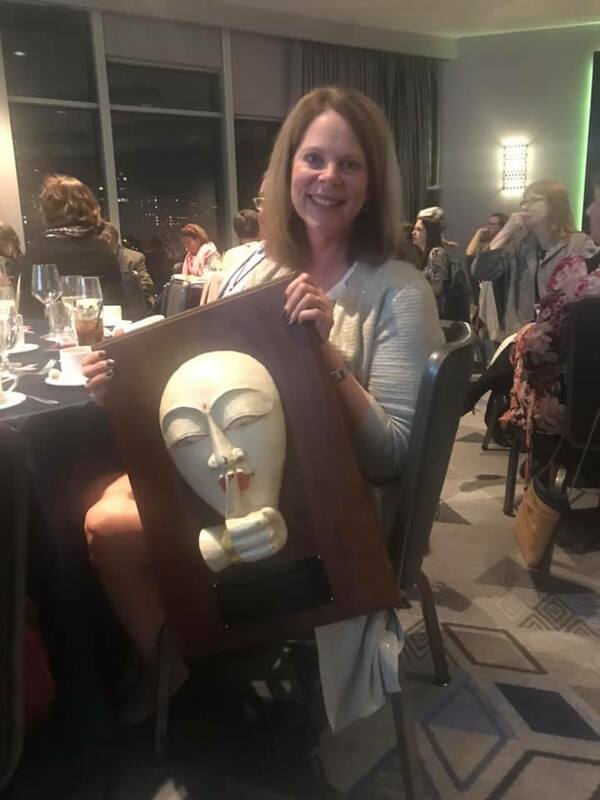 We are thrilled to announce that the 2019 winner of the Marky Award is Renee Chevallier! Renee joined AISL in 2004, and her first conference was Dallas ’04. She has been at Ursuline Academy of Dallas for 20 years as their library director, and most recently has also become their archivist (although she wears many different hats at school!). Renee was the conference co-chair for Dallas ’14, and has been a valued member of the AISL board for five years. Currently, she is our hardworking and diligent treasurer. Thank you to Barbara Share, Marky Award winner ’18 for sharing her speech. I have amended the original for the blog format. The 2017 Recipient of the Annual Marky Award Is … Dave Wee. The Marky Award was inspired by founding member Mark Hillsamer, the librarian at St. Albans School, Washington DC for 36 years. Mark helped to establish AISL in 1987 and fostered its growth for 14 years. It very well may have been “Mark’s smiling face, soothing voice, and wry sense of humor” that kept the organization going during those years. 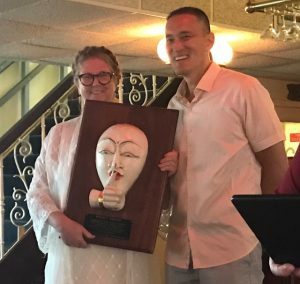 Walter DeMelle formally announced Mark’s retirement at the Skip Anthony Lecture Banquet in 2001 and presented Mark with a special gift: a mask from Thailand of a lovely lady who holds her index finger gently to her lips in a familiar shushing gesture. The Marky Award has been given annually since 2002, honoring AISL members who have made a significant contribution to the organization over a long period of time. A mounted replica of Mark’s gift is given to the winner to be displayed in his or her library until the next conference, together with a small unpainted replica of the mask for the honoree to keep. The honoree is chosen by the past Marky winners, and is presented with the award at the annual Skip Anthony banquet. What follows is the speech from the evening of the Skip Anthony Dinner in New Orleans aboard the Creole Queen on Friday, March 24th, 2017. Good evening. I am Milly Rawlings, and I am presenting the Marky Award tonight. Jean Bruce would be this year’s presenter if she were here, but she left on Tuesday because of a death in the family. Karen Gray received the award before Jean and Diane Neary before Karen, and I received it before Diane. We’ve dug deep here for me to present this year’s award, but, as the most recent recipient here, I am delighted to step in for Jean. I want to make this presentation a bit differently than we have in the past. The presenter usually gives information about the recipient and then announces the person’s name at the end. I would like to announce the recipient first and then read what this person’s colleagues sent to me, because I could not find a way to paraphrase the lovely things they wrote. What they wrote explains perfectly why the Committee selected this person as the recipient of this year’s Marky Award. It gives me tremendous pleasure to present the Marky Award to Dave Wee. CD McLean holds the Marky Award on Dave Wee’s right as Dave waits to hear the end of Milly’s speech. Dave Wee came to Harvard-Westlake fresh out of library school (Sept 2001) leaving his home state of Hawaii to settle into LA and the independent school system. He used to joke that I had taken such a risk when choosing him for the position – he was new to the field and he couldn’t catalog to save his life. Coming to us with a background in education, he was able to apply this knowledge in many areas inside and outside of the library. I had the honor of watching him grow into a confident and very skilled school librarian. Dave became my go to curriculum guy. He was the one approaching departments and talking to them about possible research projects or suggesting sources that the library had to offer. He was the one to take on mapping out all of the research projects to see if we were covering all of the information-seeking skills our students needed. He played a major role in developing lessons for our ever changing Library and Technology 7 course, helping to keep the course current with the changes in technology and the needs of our students. He worked closely with the communication and debate teachers to introduce them to and encourage them to use the resources of the library. At one point he designed a lesson that was so well received that they wanted to tape him teaching it so that it could be used over and over again. Dave’s passion for helping his students make connections lead him to become a faculty leader of the debate team. He not only guided his students in the art of presenting a well-supported argument but also helped them discover new resources and guided them in the evaluation and organization of the information gathered. Dave is a passionate teacher and is eager to help his students learn and grow. He celebrates their successes and supports them in overcoming their defeats. Dave is not someone who likes to sit still. He may not always be physically moving but his mind is always working. He is constantly consuming information. Whether he is reading or watching TV he is taking it all in. The amount of information that he is able to track and organize is amazing. I used Dave as my filter. I figured if he was telling me about an article he read or emailing the latest tech in education trend I should pay attention. It also didn’t hurt to have a recommendation or two for something entertaining. All of AISL can attest to his knowledge, his problem solving abilities and his eagerness to share what he has learned or discovered along the way. He wants to share so much that when he first started at HW he had to take a timer to class to make sure that he stopped talking in order to give the students enough time to actually search for resources. There is also the fun side of Dave. He loves to travel and has ventured to many places around the world. He loves to eat – I saw his tweet of the alligator po’boy that he had the other night in NO. I’ve had a lot of meals with him and I don’t think there is anything that he doesn’t like. He has a good sense of humor and can be a bit mischievous. He often cracks himself up. His laughter is genuine and comes from deep down inside. He and one of our other librarians were crowned the Waldorf and Statler (hecklers from the Muppet Show) of the library. Together they would sit at the circ desk and “heckle” students as they came in. Dave Wee was well respected at Harvard-Westlake as a colleague and as a friend. His departure saddened us all. I am glad that the opportunity presented itself for him to step into a position of leadership and make the desired move home to be with family. I am glad that he has found a school that has allowed him to spread his wings, a school that supports his educational philosophy, a school that is allowing him to grow even more as a librarian, as a teacher and as a valued colleague. The man is ALWAYS connected. He blogs, he tweets, he … does whatever other verbs are out there related to social media. I’ve never met anyone as media-savvy as Dave. Besides the virtual world, Dave is pretty savvy in the real one, too. 🙂 He’s made quite a few of my wishlist dreams come true, from making a board game and coloring station in the library to brainstorming ideas for expo-marker walls and chalkboard paint desks throughout the library. It’s pretty cool having him around: while I am a “let’s-make-do-with-what-we-have” sort of person, Dave is very much a “what-can-we-do-to-get-more” kind of guy. He’s definitely rocked our world, and we are the better for it. Please join all of AISL in our warm congratulations to our well deserving colleague Dave Wee! Please put your virtual hands together! !